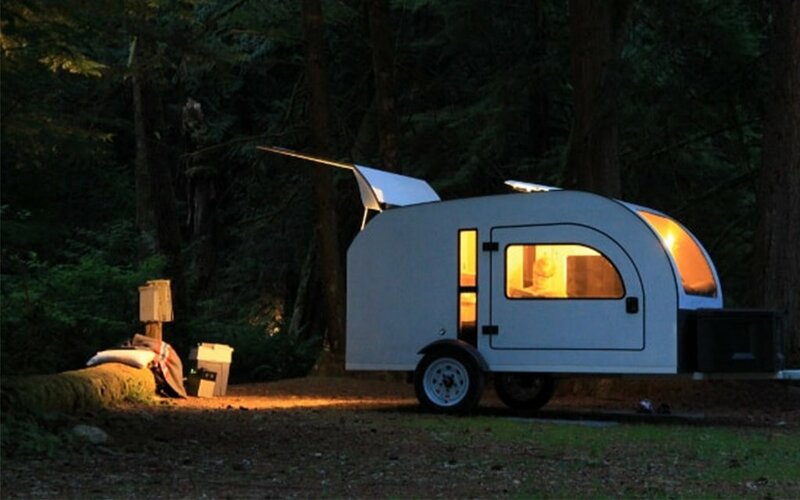 And now, a dispatch from our friendly neighbors to the North, in the form of the small but deceptively amenity-packed Droplet trailer. 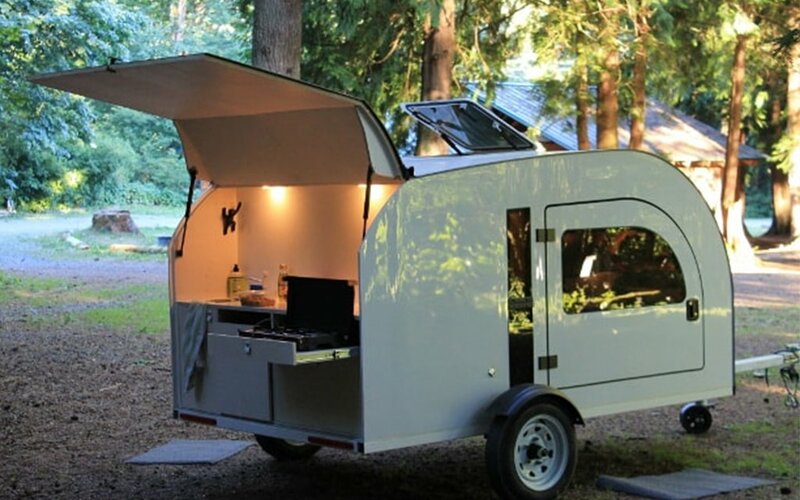 Sometimes they like to call it a camping pod, which is fine by us, because not many sub-1,000-pound tow-alongs can fit a queen-sized bed and a covered, kitted-out kitchen, all while having more windows than a greenhouse. And that light load? It’s thanks in part to the high-tech laminate used, which was inspired by aeronautical and nautical engineering. That means even your mid-sized rig should be able to tow it — from a Ford Focus to a Volkswagen Golf. 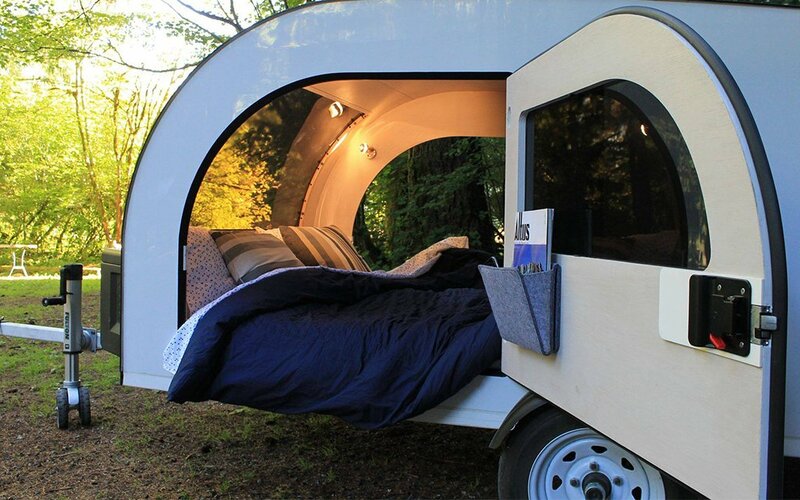 Droplets are designed in Vancouver, B.C., and it’s clear the vision was aiming to hit somewhere between camping and glamping, with a focus on comfort for moments when you’re at rest: big windows make stargazing a must, wide doors for entry make it body-friendly (“no need to be a Yogi to get in”) and there’s plenty of clever storage for your creature comforts and outdoor gear. Buying options include a road-ready package and an off-grid package for trips that might have more electrical needs, or there’s a “naked” option that is sans kitchen — but offering you more customization options. Not ready to pull the trailer (heh)? You can also rent one through their partnerships with Airbnb, Outdoorsy, Kit2Kamp and more, and if within six months you decide to buy, they apply your rental fees to the total price.